The last couple of years have witnessed a fascinating evolution: while the Web was initially built predominantly for human consumption, web content is increasingly consumed by machines which expect some amount of structured data. Sites have started to identify a page's title, content type, and preview image to provide appropriate information in a user's newsfeed when she clicks the "Like" button. Search engines have started to provide richer search results by extracting fine-grained structured details from the Web pages they crawl. In turn, web publishers are producing increasing amounts of structured data within their Web content to improve their standing with search engines. A key enabling technology behind these developments is the ability to add structured data to HTML pages directly. RDFa (Resource Description Framework in Attributes) is a technique that allows just that: it provides a set of markup attributes to augment the visual information on the Web with machine-readable hints. In this Primer, we show how to express data using RDFa in HTML, and in particular how to mark up existing human-readable Web page content to express machine-readable data. This document provides only a Primer to RDFa 1.1. The complete specification of RDFa, with further examples, can be found in the RDFa 1.1 Core [ rdfa-core ], RDFa Lite [ rdfa-lite ], XHTML+RDFa 1.1 [ xhtml-rdfa ], and the HTML5+RDFa 1.1 [ html-rdfa ] specifications. This document was published by the RDFa Working Group as a Working Group Note. If you wish to make comments regarding this document, please send them to public-rdfa@w3.org (subscribe, archives). All comments are welcome. 3. You Said Something about RDF? The web is a rich, distributed repository of interconnected information. Until recently, it was organized primarily for human consumption. 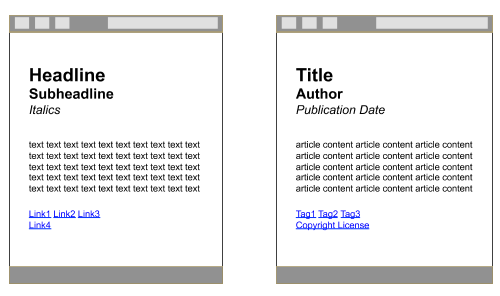 On a typical web page, an HTML author might specify a headline, then a smaller sub-headline, a block of italicized text, a few paragraphs of average-size text, and, finally, a few single-word links. Web browsers will follow these presentation instructions faithfully. However, only the human mind understands what the headline expresses-a blog post title. The sub-headline indicates the author, the italicized text is the article's publication date, and the single-word links are subject categories. Computers do not understand the nuances between the information; the gap between what programs and humans understand is large. Figure 1: On the left, what browsers see. On the right, what humans see. Can we bridge the gap so that browsers see more of what we see? What if the browser, or any machine consumer such as a Web crawler, received information on the meaning of a web page's visual elements? A dinner party announced on a blog could be copied to the user's calendar, an author's complete contact information to the user's address book. Users could automatically recall previously browsed articles according to categorization labels (i.e., tags). A photo copied and pasted from a web site to a school report would carry with it a link back to the photographer, giving him proper credit. A link shared by a user to his social network contacts would automatically carry additional data pulled from the original web page: a thumbnail, an author, and a specific title. When web data meant for humans is augmented with hints meant for computer programs, these programs become significantly more helpful, because they begin to understand the data's structure. RDFa allows HTML authors to do just that. Using a few simple HTML attributes, authors can mark up human-readable data with machine-readable indicators for browsers and other programs to interpret. A web page can include markup for items as simple as the title of an article, or as complex as a user's complete social network. Historically, RDFa 1.0 [ rdfa-syntax ] was specified only for XHTML. RDFa 1.1 [ rdfa-core ] is the newer version and the one used in this document. RDFa 1.1 is specified for both XHTML [ xhtml-rdfa ] and HTML5 [ html-rdfa ]. In fact, RDFa 1.1 also works for any XML-based languages like SVG [ svg11 ]. This document uses HTML in all of the examples; for simplicity, we use the term "HTML" throughout this document to refer to all of the HTML-family languages. RDFa is based on attributes. While some of the HTML attributes (e.g., href, src) have been re-used, other RDFa attributes are new. This is important because some of the (X)HTML validators may not properly validate the HTML code until they are updated to recognize the new RDFa attributes. This is rarely a problem in practice since browsers simply ignore attributes that they do not recognize. None of the RDFa-specific attributes have any effect on the visual display of the HTML content. Authors do not have to worry about pages marked up with RDFa looking any different to a human being from pages not marked up with RDFa. We begin the introduction to RDFa by using a subset of all the possibilities called RDFa Lite 1.1 [ rdfa-lite ]. The goal, when defining that subset, was to define a set of possibilities that can be applied to most simple to moderate structured data markup tasks, without burdening the authors with additional complexities. Many Web authors will not need to use more than this minimal subset. Consider Alice, a blogger who publishes a mix of professional and personal articles at http://example.com/alice. We will construct markup examples to illustrate how Alice can use RDFa. A more complete markup of these examples is available on a dedicated page. Figure 2: A visualization of the structured data for a blog post with a title of "The Trouble with Bob" and a creation date. It is worth emphasizing that RDFa uses URLs to identify just about everything. This is why, instead of just using properties like title or created, we use http://purl.org/dc/terms/title and http://purl.org/dc/terms/created. The reason behind this design decision is rooted in data portability, consistency, and information sharing. Using URLs removes the possibility for ambiguities in terminology. Without ensuring that there is no ambiguity, the term "title" might mean "the title of a work", "a job title", or "the deed for real-estate property". When each vocabulary term is a URL, a detailed explanation for the vocabulary term is just one click away. It allows anything, humans or machines, to follow the link to find out what a particular vocabulary term means. By using a URL to identify a particular creation time, for example http://purl.org/dc/terms/created, both humans and machines can understand that the URL unambiguously refers to the "Date of creating the resource", such as a web page. By using URLs as identifiers, RDFa provides a solid way of disambiguating vocabulary terms. It becomes trivial to determine whether or not vocabulary terms used in different documents mean the same thing. If the URLs are the same, the vocabulary terms mean the same thing. It also becomes very easy to create new vocabulary terms and vocabulary documents. If one can publish a document to the Web, one automatically has the power to create a new vocabulary document containing new vocabulary terms. The previous example demonstrated how Alice can markup text to make it machine readable. She would also like to mark up the links in a machine-readable way, to express the type of link being described. RDFa lets the publisher add a "flavor", i.e., a label, to an existing clickable link that processors can understand. This makes the same markup help both humans and machines. A human clearly understands this sentence, in particular the meaning of the link with respect to the current document: it indicates the document's license, the conditions under which the page's contents are distributed. Unfortunately, when Bob visits Alice's blog, his browser sees only a plain link that could just as well point to one of Alice's friends or to her CV. For Bob's browser to understand that this link actually points to the document's licensing terms, Alice needs to add some flavor, some indication of what kind of link this is. Figure 3: A link with flavor: the link indicates the web page's license. We can represent web pages as nodes, the link as an arrow connecting those nodes, and the link's flavor as the label on that arrow. Alice is quite pleased that she was able to add only structured-data hints via RDFa, never having to repeat the content of her text or the URL of her clickable links. Note how the property values are single "terms" now; these are simply concatenated to the URL defined via the vocab attribute. The attribute can be placed on any HTML element (i.e., not only on the body element like in the example) and its effect is valid for all the elements below that point. because the vocab in the license paragraph overrides the definition inherited from the body of the document. The vocab attribute references structured data vocabularies, identified using URLs. RDFa does not limit the form of these URLs or the document formats accessible by de-referencing them; however users SHOULD aim to use widely shared, conventional values for identifying such vocabularies, following conventions of case, spelling etc. established by their publishers. Figure 4: Multiple Items per Page: each blog entry is represented by its own node, with properties attached to each. Alice would also like to make information about herself, such as her email address, phone number, and other details, easily available to her friends' contact management software. This time, instead of describing the properties of a web page, she's going to describe the properties of a person: herself. Alice already has contact information displayed on her blog. Alice realizes that she only intends to use the FOAF vocabulary at this point, so she uses the vocab attribute to simplify her markup further (and overriding the effects of any vocab attributes that may have been used in, for example, the body element at the top). Figure 6: A Blank Node: blank nodes are not identified by URL. Instead, many of them have an RDFa typeof attribute that identifies the type of data they represent. First, Alice indicates that the friends she is describing are people, as opposed to animals or imaginary friends, by using again the Person type in typeof attributes. Alice is happy that, with so little additional markup, she's able to fully express both a pleasant human-readable page and a machine-readable dataset. Figure 7: Alice's social network. Note that, with RDFa, Alice could express a fairly complex set of information that others can use. which may be tedious and error prone. 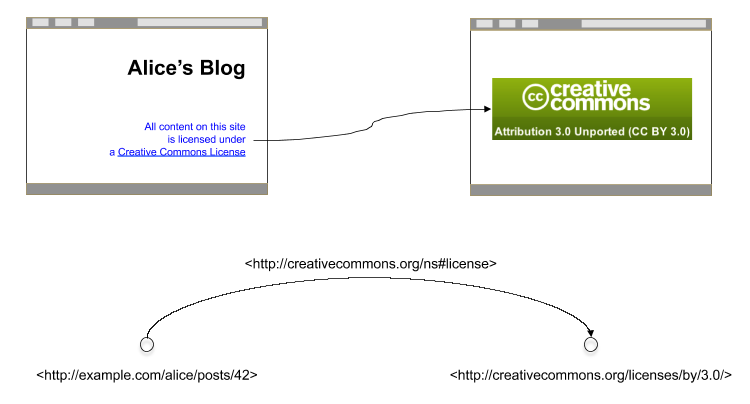 Figure 8: Creative Commons statements added to each blog item separately. 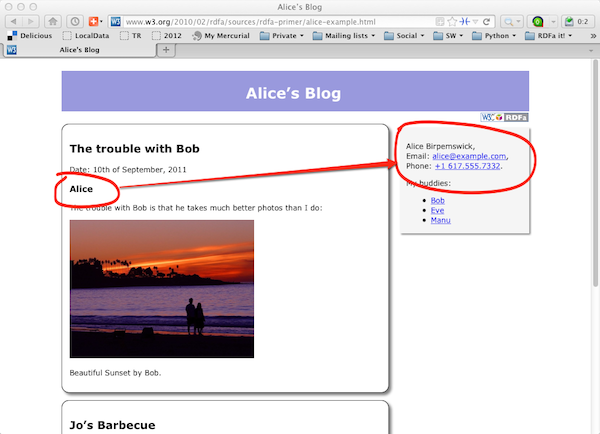 Figure 9: Alice's blog item with data about herself. Unfortunately, this solution is not optimal in two respects. First of all, notice that Alice had to use the full URI for the creator property: this is because the vocab attribute is used to set the FOAF terms, i.e., the simple creator value would have been misinterpreted. We will come back to the issue of using several vocabularies in another section below. 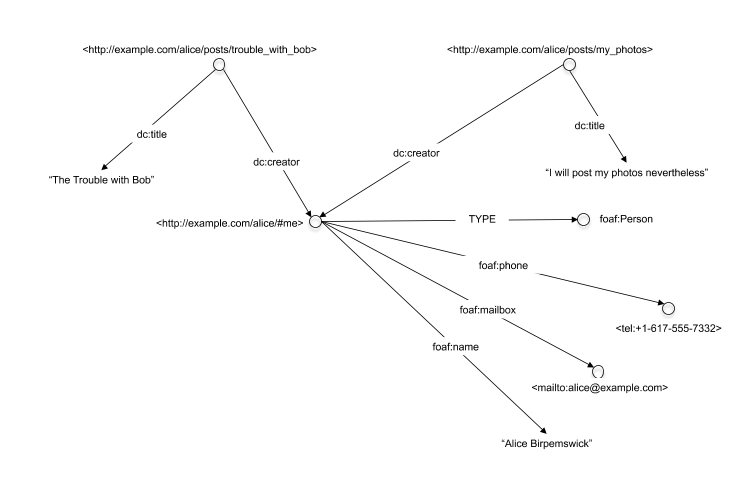 Figure 10: Structure of Alice's Site: individual blog items on the left, personal data, linked from the blog using RDFa terms, in a sidebar. If the FOAF data were included in each blog item, Alice would have to create a complex set of CSS rules to achieve the visual effect she wants. It is actually considered as a good practice to use real URIs whenever possible, i.e., Alice's new alternative should be preferred in general. Indeed, if a real URI is used, then it becomes possible to unambiguously refer to that particular piece of information, whereas that becomes more complicated with blank nodes. 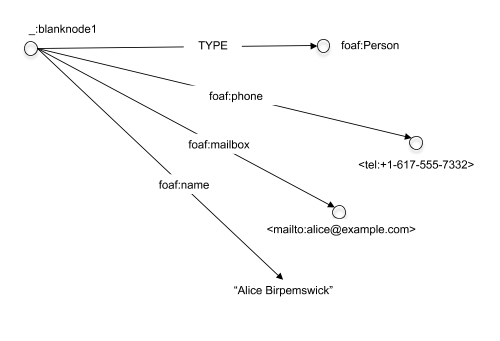 The resource="#me" markup (which, by the way, also presupposes that the target is in the same HTML scope) is a FOAF convention: the URL that represents the person Alice is http://example.com/alice#me. It should not be confused with Alice's homepage, http://example.com/alice. Of course, Alice could have used a different URI if, for example, her blog and her personal homepage were kept separate; e.g., she could have used resource="http://alice.example.com/alice/home#myself" instead of resource="#me". Figure 11: Alice's blog item with data about herself, using an explicit URI for her FOAF data. Figure 12: Several of Alice's blog items with data about herself, using an explicit URI for her FOAF data. Combined with property, the resource attribute plays exactly the same role as href, already used for "links with flavor", except that it does not provide a clickable link to the browser like href does. Also, the resource attribute can be used on any HTML element, as opposed to href whose usage is restricted, in HTML, to the a and link elements. There is a similarity between this issue and its solution and the issue and the approach taken in the section on property copying. There is, however, a subtle but important difference between the two. The solution using the resource attribute introduces a new node in the graph, as shown on Figure 12, whereas copying the properties does not. Which of the two approaches should be adopted is often based on the vocabulary that is used. The previous examples show that, for more complex cases, multiple vocabularies have to be used to express the various aspects of structured data. We have seen Alice using the Dublin Core, as well as the FOAF and the Creative Commons vocabularies, but there may be more. For example. Alice may want to add vocabulary elements defined by search engines on their schema.org site [ schema ]. 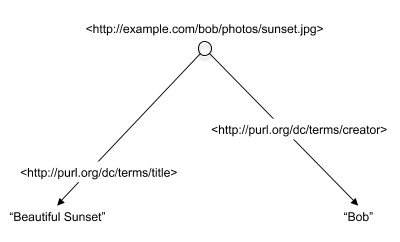 Note that the schema.org and the Dublin Core terms are intertwined for a specific blog, and it becomes an arbitrary choice whether to use the vocab attribute for http://purl.org/dc/terms/ or for http://schema.org/. We have seen the same problem in a previous section when FOAF and Dublin Core terms were mixed. An important issue may arise if the html element contains a large number of prefix declarations. The character encoding (i.e., UTF-8, UTF-16, ASCII, etc.) used for an HTML5 file is declared using a meta element in the header. In HTML5 this meta declaration must fall within the first 512 bytes of the page, or the HTML5 processor (browser, parser, etc.) will try to detect the encoding using some heuristics. A very "long" html tag may therefore lead to problems. One way of avoiding the issue is to place most of the prefix declarations on the body element. Figure 13: Alice's blog item using two different vocabularies, including two properties with the same context and target. 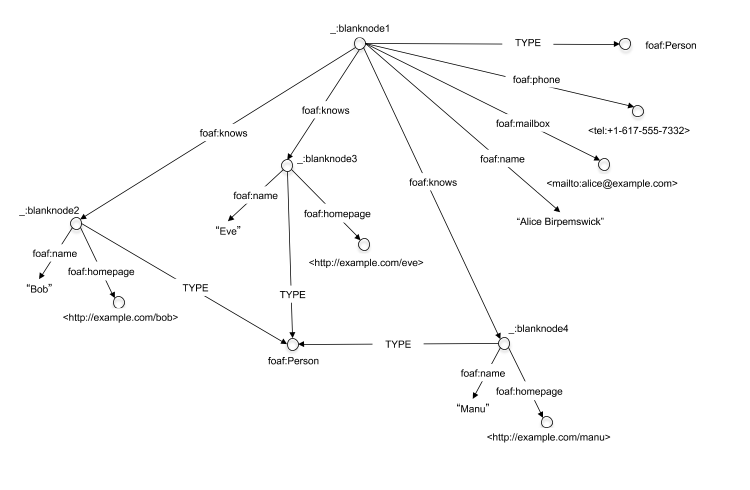 <div class="sidebar" prefix="foaf: http://xmlns.com/foaf/0.1/ schema: http://schema.org/"
A number of vocabularies are very widely used by the Web community with well-known prefixes—the Dublin Core vocabulary is a good example. These common vocabularies tend to be defined over and over again, and sometimes Web page authors forget to declare them altogether. To alleviate this issue, RDFa introduces the concept of an initial context that defines a set of default prefixes. These prefixes, whose list is maintained and regularly updated by the W3C, provide a number of pre-defined prefixes that are known to the RDFa processor. Prefix declarations in a document always override declarations made through the defaults, but if a web page author forgets to declare a common vocabulary such as Dublin Core or FOAF, the RDFa Processor will fall back to those. The list of default prefixes are available on the Web for everyone to read. However, an RDFa processor still recognizes the dc:title and dc:creator short-hands and expands the values to the corresponding URLs. The RDFa processor is able to do this because the dc prefix is part of the default prefixes in the initial context. Default prefixes are used as a mechanism to correct RDFa documents where authors accidentally forgot to declare common prefixes. While authors may rely on these to be available for RDFa documents, the prefixes may change over the course of 5-10 years, although the policy of W3C is that once a prefix is defined as part of a default profile, that particular prefix will not be changed or removed. Nevertheless, the best way to ensure that the prefixes that document authors use always map to the intent of the author is to use the prefix attribute to declare these prefixes. Since default prefixes are meant to be a last-resort mechanism to help novice document authors, the markup above is not recommended. The rest of this document will utilize authoring best practices by declaring all prefixes in order to make the document author's intentions explicit. As we have seen in the previous sections, RDFa Lite is fairly powerful. Alice could indeed express complex sets of structured information. However, there are cases when the set of attributes presented so far does not cover all the needs, or make the resulting HTML structure a bit awkward and possibly error-prone. In those cases additional RDFa possibilities, provided through additional RDFa attributes, may come to the rescue; some of these will be presented in this section. RDFa Lite does not define a separate class of RDFa processors. In other words conforming RDFa processors are supposed to handle all RDFa features, not only those listed used by RDFa Lite. However, to do that, Alice had to accept a small compromise. Indeed, although the string "2011-09-10" unambiguously identifies a date for a machine, it does not looks very natural for a human reader. Surely a native English reader would prefer something like "10th of September, 2011". On the other hand, although it is of course possible for a machine to parse and interpret that string as a date, too, it is clearly more complicated to do so. The problem is that, as a default, RDFa uses the textual content of the element for the property value. While this works well in most of the cases, sometimes, like in this example, this has awkward consequences. The resulting structure is exactly the same as before (i.e., Figure 2). The difference is the presence of the content attribute: it instructs the RDFa processor to overrule the default behavior of using the textual content, and to use the value of the content attribute instead. Using this attribute Alice could provide a more readable date, while maintaining an unambiguous content for machines using the structured data. However, the value used for the date may be ambiguous for machines. Of course, if a program "knows" that that http://purl.org/dc/terms/date refers to a date, then of course it can find out that the string "2011" stands for a year. But there may be processors that, for example, provide a visual presentation of all the structured data on a specific page, and would like to use a different "widget" to represent a year and again another one to represent, say, an integer number. How would such a processor know which one to choose? The role of the resource attribute in the div element is to set the "context", i.e., the subject for all the subsequent statements. Also, when combined with the property attribute, resource can be used to set the "target", i.e., the object for the statement (much as href). would not be correct; the combination of property and resource would generate a different statement than originally intended. Each "branch" in the list sets a separate object (blank nodes in this example) and the same property (foaf:knows) is used to bind them to the same context. The property="knows" had to be repeated in each list element to define the corresponding property. If this structure is generated by some CMS systems, this is of course not a problem. However, if such structure is authored manually, it is clearly error prone: the property name can be misspelled or forgotten. In contrast to property, rel never considers the textual content of an element (or the value of the content attribute). Instead, if no clear target has been specified for a link via, e.g., a resource or an href attribute, the processor is supposed to go “down” and find one or more targets in the hierarchy and use those. This is what happens in this case: the knows attribute on the ul element does not include any obvious target; however, the processor finds those in the individual li elements and will use those. This pattern is typical for the usage of rel. In many situations, property and rel are interchangeable when the intended structured data involves (flavored) links. There are, however, subtle differences involving, for example, “chaining” that must be used with care. The interested reader should consult the relevant section of the RDFa 1.1 specification for further details. In general, it is advised to use property, when possible. RDFa benefits from the power of RDF [ rdf11-primer ], the W3C's standard for interoperable machine-readable data. Although readers of this document are not expected to understand RDF, some may be interested in how these two specifications interrelate. RDF, the Resource Description Framework, is the abstract data representation we have drawn out as graphs in the examples above. Each arrow in the graph is represented as a subject-property-object triple: the subject is the node at the start of the arrow, the property is the arrow itself, and the object is the node or literal at the end of the arrow. A set of such RDF triples is often called an "RDF graph", and is typically stored in what is often called a "Triple Store" or a "Graph Store". The point of RDF is to provide a universal language for expressing data and relationships. A unit of data can have any number of properties that are expressed as URLs. These URLs can be reused by any publisher, much like any web publisher can link to any web page, even ones they did not create themselves. Using data in the form of RDF triples, collected from various locations, and also using the RDF query language SPARQL [ sparql11-query ], one can search for "friends of Alice's who created items whose title contains the word 'Bob'," whether those items are blog posts, videos, calendar events, or other data types. RDF is an abstract data model meant to maximize the reuse of vocabularies. RDFa is a way to express RDF data within HTML, in a way that is machine-readable, and by reusing the existing human-readable data in the document. As Alice marks up her page with RDFa, she may discover the need to express data, such as her favorite photos, that is not covered by existing vocabularies. If she needs to, Alice can create a custom vocabulary suited for her needs. Once a vocabulary is created, it can be used in RDFa markup like any other vocabulary. Selecting a URL where the vocabulary will reside, for example: http://example.com/photos/vocab#. Publishing the vocabulary document at the specified vocabulary URL. The vocabulary document defines the classes and properties that make up the vocabulary. For example, Alice may want to define the classes Photo and Camera, as well as the property takenWith that relates a photo to the camera with which it was taken. Using the vocabulary in an HTML document either with the vocab attribute or with the prefix declaration mechanism. For example: prefix="photo: http://example.com/photos/vocab#" and typeof="photo:Camera". It is worth noting that anyone who can publish a document on the Web can publish a vocabulary and thus define new data fields they may wish to express. RDF and RDFa allow fully distributed extensibility of vocabularies. There is a wide variety of tools that can be used to generate or process RDFa data. Good sources for these are the RDFa page of the W3C Semantic Web Wiki, although care should be taken that some tools may be related to a previous version of RDFa. Another source may be the RDFa community site’s implementation page. Both these sources are constantly evolving. By the way, the latter is part of a more general community page that contains further examples for using RDFa, general information, as well as information on how to get involved. In particular, RDFa fragments can be tested using the real-time RDFa 1.1 editor that can also display a visual representation of the underlying structural data. Thanks also to Grant Robertson and Guus Schreiber who, though not part of the Working Group, have provided useful comments on earlier drafts of this note.